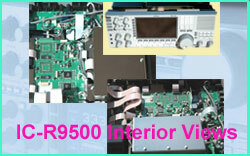 Icom IC-R9500 Professional Receiver with 5 roofing filters, 48 kHz DSP and other new features. 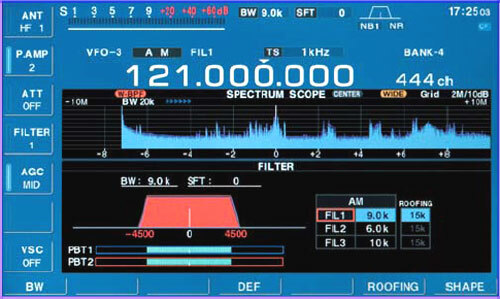 The Icom professional receiver has an extremely rational architecture. Its circuits have been designed using avant-garde approaches and components which offer the fascinating possibility of examining it, and even better, having it in one's own shack! BPF Unit (HF 0.005 - 29.999 MHz) with two antenna sockets ANT1 and ANT2. The 12 bandpass filters are switched with 30 ATN207-K1 electromechanical relays. Uses toroidal inductors type LR-447, LR-450, LR-455, LR-443 and LR-476. Two sections (ANT1 and ANT2) with BPF and separate preamp for each frequency range. ANT1: 30 to 1150 MHz. ANT2: 1150 to 3335 MHz. 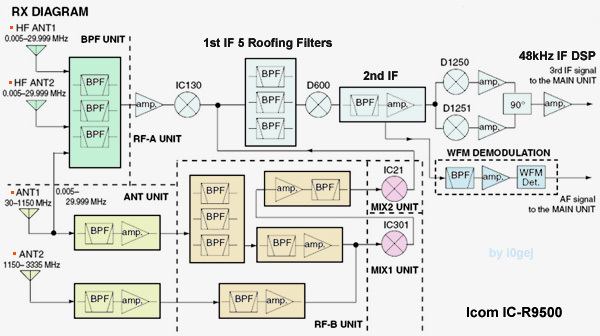 Given the high frequencies employed, particular care has been taken in the design of the dedicated BPF and RF amplifier units. These are on separate circuit boards, each fitted with its own metallic shield. The LO signal at 1 GHz and above is "doubled by doublers on the DOUBLER BOARD". In Mix1, IC301 is a SYM-30DHW; in Mix2, IC21 is a SPM5001-TL-E. Check out Gary, ZS6YI's IC-R9500 User Review and interior photos on VA7OJ pages. Mini-scope function example (image up) The multi-function spectrum scope using a dedicated DSP unit improves the dynamic range of the spectrum scope. The spectrum has four different modes such as "normal/ wide" and "center/ fixed width". The normal spectrum scope covers a range from +/- 2.5kHz to 5MHz, while the wideband spectrum receives up to +/- 500MHz (+/- 10 - 25 - 50 - 100 - 250 - 500MHz selectable). The minimum resolution bandwidth (RBW) is 100 Hz. 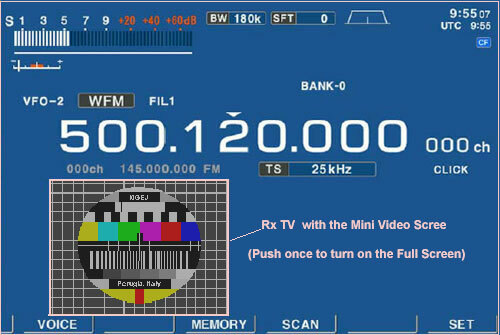 TV channel operation (except for USA version) - TV tuner is built into IC-R9500 receiver. It is possible to receive analogue TV channels directly (except for USA versions) with the internal tuner, or with an external tuner or other device. TV video signals are handled via the two rear-panel jacks marked VIDEO IN and VIDEO OUT; by connecting a jumper cable between these jacks, TV images can be viewed directly on the IC -R9500 display screen. By pressing the DISPLAY button, it is possible to select a "full video screen" or a "mini video screen". The latter permits monitoring the TV image whilst viewing the receiver operating parameters and function displays. All the menus are also displayed in successive pop-ups as the operator steps through them. 7 inch wide colour TFT LCD Display, and high resolution spectrum scope. A dedicated DSP unit - TMS320C6714 - improves the dynamic range of the spectrum scope. It is interesting to note that all functions and data required for functional control by the operator are displayed simultaneously on the screen. The Spectrum Scope is set for 2 MHz span (±1 MHz either side of centre frequency.) In the R9500, the "Peak Marker" function can be activated, to mark the strongest signal in the displayed spectrum. The receive frequency is displayed numerically above the graticule. Pressing RX will centre the spectral display on this frequency. 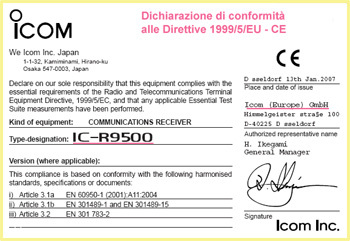 Icom has obtained USA FCC certification (ID: AFJ284401) for the IC-R9500 on February 23, 2007. The list price is USD 15990 (special price: USD 13550). In accordance with CE norms, Icom Europe GmbH has obtained a Declaration of Conformity to Directive 1999/5/EC. Therefore the IC-R9500 All-Mode Professional Receiver, 0.005 - 3335 MHz, is now available on the EU market. The Italian Icom distributor, , shows a list price of € 11.913,00 (+ 20% VAT) for Series #04 (Europe Version). The actual sale price appears to be in the € 12.000,00 range, including VAT. Below 30 MHz, the internal switched attenuator can be set to 6, 12, 18, 24 and 30 dB. From 30 to 1150 MHz, the steps are 10, 20 and 30 dB. From 1150 to 3335 MHz, only a 30 dB attenuator is provided. Report by Lidio Gentili IØGEJ, updated 28.08.2006. 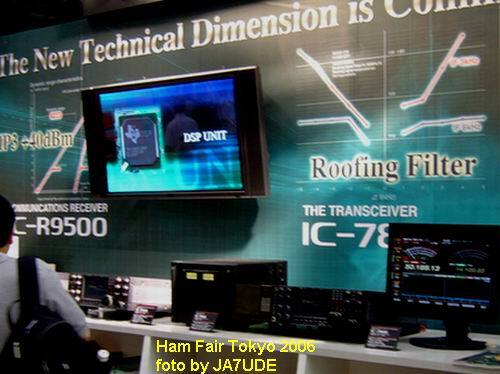 Tokyo Ham Fair 2006 - An interesting picture showing how Icom has presented its new technology as implemented in its two flagship radio sets, the IC-9500 and IC-7800: "The New Technical Dimension is Coming." 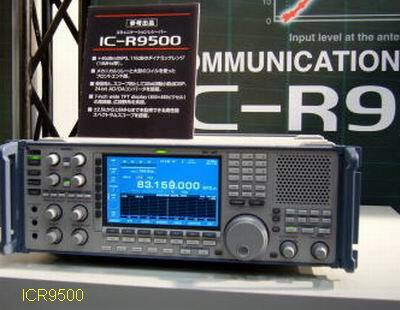 A striking new product, first shown at Tokyo HamFair 2006 (19 - 20 August 2006): The new IC-R9500 Professional Receiver, targeting the commercial and military/governmental sectors etc. This is a high-end receiver which is intended to compete in the markets now served by Rockwell-Collins, R&S and Harris. Estimated price level is in the vicinity of 10 000 Euro (USD 13 000). 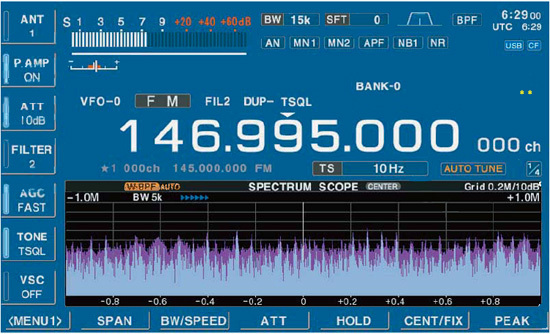 Icom defines it thus: Super performance, multiple function wideband "measuring" receiver. Data from brochure: Frequency range 5 kHz to 3335.000 MHz, with 5 first-IF roofing filters (bandwidths 3, 6, 15, 50 and 240 kHz), selectable according to reception mode: AM, FM, WFM, SSB, CW, RTTY and optional APCO P25 digital voice. 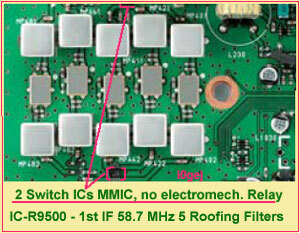 The IC-R9500 is fitted with two DSP IC's, one dedicated to the receiver at a final IF of 48kHz* and the other to the digital filters of the spectrum scope. The DSP's employ the Texas Instruments TMS320C6713BZDP, which is similar to the devices used in the IC-7800 (TMS320C6713GDP). To reduce interference from strong adjacent signals, the HF range utilises a BPF Unit with electromechanical relays and large toroidal inductors, as shown in the above photo. The BPF Unit is based on the one developed for the IC-7800. This receiver features a built-in spectrum analyser with a span range from ± 2.5 kHz to ± 5 MHz, with selectable speed and resolution bandwidth (RBW). The RBW is selectable from 200Hz to 20kHz, allowing the operator to view a weak signal in the presence of strong adjacent signals. The 7-inch colour TFT LCD display screen has 800 X 480 pixels resolution. A rear-panel VGA socket allows direct connection of an external monitor. The built-in digital recorder has up to 60 minutes (approx.) recording time. 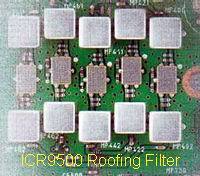 The IC-R9500 has 10 VFO channels, each of which saves its own parameters in memory (band, mode, filters etc.) Various scan modes can be set up; in memory mode, the scan rate approaches 40 channels per second !! Copyright (c) 2004-2006 I0GEJ Lidio Gentili. All rights reserved.